A spokesperson for the United States military has tonight categorically denied reports of a U.S. helicopter opening fire on Libyan civilians during a rescue mission of two fighter pilots who crashed near the eastern city of Benghazi. Conflicting reports have emerged of the mission to rescue the two U.S. fighter pilots who ejected from their aircraft. The F-15E Strike Eagle that they were flying reportedly suffered a mechanical failure on Monday night and crashed. Soon after the accident, a U.S. military helicopter landed in the area to extract the airmen and reportedly opened fire on civilians, wounding six of them. Photograph of a V-22 Osprey. Unconfirmed reports indicate the six civilians were taken to a hospital in the area after being fired upon by the helicopter, a V-22 Osprey. One of the wounded, a young boy, was shot in the leg, which will likely now require amputation. Another of those reported injured said the shooting caused “great panic.” Wikinews understands the Pentagon is to open an investigation into the rescue mission. Aerial view of The Pentagon, Arlington, Virginia. However, a U.S. military spokesperson denied the reports “one hundred percent”, and said the incident “didn’t happen”. He said the aircraft which rescued the two airman was not fitted with weapons. “The Osprey is not armed and the Marines barely came off the aircraft,” he said. The pilot of the fighter aircraft was extracted during the rescue mission, while the weapons officer was found and cared for by Libyan rebels before later being retrieved by American forces. Both crew members suffered only minor injuries, the military said. The fighter aircraft was deployed over Libya in support of the no-fly zone approved by the United Nations Security Council over Libya as part of Operation Odyssey Dawn. Study suggests pollution from airplanes flying at ‘cruise’ altitudes contributes to 8,000 deaths per year globally. The atmosphere is full of natural and man-made chemicals, including emissions from fuel combustion and byproducts of living organisms. Many of these chemicals combine in the atmosphere to form tiny solid and liquid particles known as “fine particulate matter” that are 2.5 micrometers or smaller (the average human hair is about 70 micrometers in diameter, by comparison). While it’s not clear whether all of these particles may be harmful, some are; the danger to humans comes when they are inhaled and trapped in the lungs, where they can then enter the bloodstream. In 2004, the World Health Organization estimated that about one million deaths per year are caused by air pollution, and several epidemiological studies have linked air pollution to the development of cardiovascular and respiratory illnesses, including lung cancer. Those studies tracked thousands of adults over many years to measure their exposure to air pollution while monitoring their health. Once the data were statistically analyzed to correct for other risk factors like smoking, the results indicated that increased exposure to fine particulate matter caused by air pollution is linked to health problems like chronic bronchitis and decreased lung function, as well as premature death. Aviation emissions contribute to this health problem, according to a new study that suggests that airplanes flying at a cruise altitude of around 35,000 feet emit pollutants that contribute to about 8,000 deaths per year globally. The research, reported online this month in the journal Environmental Science and Technology, provides the first estimate of premature deaths attributable to aircraft emissions at cruise altitudes. Aircraft emit nitrogen oxides (NOx) and sulfur oxides (SOx), which react with gases already existing in the atmosphere to form harmful fine particulate matter. Current worldwide regulations target aircraft emissions only up to 3,000 feet. That’s because regulators have assumed that anything emitted above 3,000 feet would be deposited into a part of the atmosphere that has significantly smoother air, meaning pollutants wouldn’t be affected by turbulent air that could mix them toward the ground. Thus, even though 90 percent of aircraft fuel is burned at cruise altitudes, only those pollutants that are emitted during takeoff and landing are regulated by measuring emissions during tests of newly manufactured engines in simulated takeoff and landing conditions. “Anything above that [altitude] really hasn’t been regulated, and the goal of this research was to determine whether that was really justified,” says lead author Steven Barrett, the Charles Stark Draper Assistant Professor of Aeronautics and Astronautics in MIT’s Department of Aeronautics and Astronautics. To study the effects of cruise emissions, Barrett used a computer model that combined data about plane trajectories, the amount of fuel burned during flights and the estimated emissions from those flights. He combined that with a global atmospheric model that accounts for air-circulation patterns in different parts of the globe and the effect of emissions to determine where aviation emissions might cause an increase in fine particulate matter. He then used data related to population density and risk of disease in different parts of the world to determine how the change in particulate matter over certain regions might affect people on the ground — specifically, whether the air pollutants would lead to an increased risk of death. Saab Gripen, a Swedish multi-role fighter aircraft. Analysis of these data revealed that aircraft pollution above North America and Europe — where air travel is heaviest — adversely impacts air quality in India and China. That is, even though the amount of fuel burned by aircraft over India and China accounts for only 10 percent of the estimated total amount of fuel burned by aircraft across the globe, the two countries incur nearly half — about 3,500 — of the annual deaths related to aircraft cruise emissions. The analysis also revealed that although every country in the Northern Hemisphere experienced some number of fatalities related to these emissions, almost none of the countries in the Southern Hemisphere had fatalities. That’s because the majority of air traffic occurs in the Northern Hemisphere, where planes emit pollutants at altitudes where high-speed winds flowing eastward, such as the jet stream, spread emissions to other continents, according to the study. Part of the reason for the high percentage of premature deaths in India and China is that these regions are densely populated and also have high concentrations of ammonia in their atmosphere as a result of farming. This ammonia reacts with oxidized NOx and SOx to create fine particulate matter that people inhale on the ground. Although agriculture is abundant in Europe and North America, the ammonia levels aren’t as elevated above those regions. Funded by the UK Research Councils with help from the U.S. Department of Transportation, the study recommends that cruise emissions be “explicitly considered” by international policymakers who regulate aviation engines and fuels. Steve Lott, a spokesman for the International Air Transport Association, a trade group that represents 230 airlines, says that aviation is “a small part of a big problem,” particularly when compared to other transportation sources of emissions, such as those caused by shipping, which a 2007 study linked to 60,000 premature deaths per year. Lourdes Maurice, the chief scientific and technical adviser for environment at the Federal Aviation Administration, says that if the agency can confirm Barrett’s findings through additional research, then it will work with the Environmental Protection Agency and the International Civil Aviation Organization to consider appropriate regulatory action. The FAA will continue to fund research to address uncertainties highlighted by Barrett’s work, she adds. Barrett is a member of the Partnership for AiR Transportation Noise and Emissions Reduction (PARTNER), a cooperative research organization that completed the study. Sponsored by the FAA, NASA and Transport Canada, PARTNER has its operational headquarters at MIT. 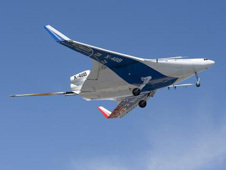 A team led by NASA and The Boeing Company has completed the first phase of flight tests on the subscale X-48B blended wing body aircraft at the agency’s Dryden Flight Research Center in Edwards, Calif. 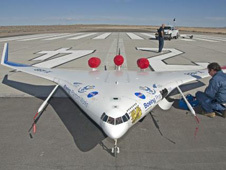 The remotely piloted, 500-pound airplane with the silhouette resembling a manta ray – also called a hybrid wing body — is a tool of NASA’s new Environmentally Responsible Aviation, or ERA, Project, which aims to develop the technology needed to create a quieter, cleaner, and more fuel-efficient airplane for the future. A flying test bed such as the X-48B enables NASA to assess and validate the key technologies. The recently concluded flight tests ascertained the handling and flying qualities of such an aircraft at speeds typical of landings and takeoffs. Until recently, Collier was principal investigator for NASA’s Subsonic Fixed Wing Project, which established the partnership with Boeing to conduct initial, fundamental technology development efforts with the X-48B. The ERA Project he now leads is part of a new research program NASA initiated to help further mature promising technology before transfer to industry. The team completed the 80th and last flight of the project’s first phase on March 19, 2010, almost three years after the X-48B’s first flight on July 20, 2007. In addition to NASA and Boeing, the team includes Cranfield Aerospace Limited of the United Kingdom, and the U.S. Air Force Research Laboratory of Dayton, Ohio. In the mid-2000s, NASA identified low-speed flight controls as a development challenge for aircraft such as the hybrid wing body. This challenge, and the challenge of building a non-circular, pressurized fuselage structure, have been the initial focuses of research since then. The ultimate goal is to develop technology for an environmentally friendly aircraft that makes less noise, burns less fuel, and emits less noxious exhaust. “These 80 research flights provided engineers with invaluable test data and allowed the team to completely meet the initial project test objectives,” said Tim Risch, Dryden’s X-48B project manager. The milestones accomplished by the team focused on three main technical objectives: flight envelope expansion, aircraft performance characterization, and validation of flight control software limiters. The first objective, envelope expansion, consisted of 20 flights over a year-long period. For these flights, the aircraft was flown through a variety of maneuvers intended to define the overall flight capabilities and discern the general stability and handling characteristics of the aircraft. Completion of these tests resulted in a preliminary flight envelope adequate for transition to higher risk testing. The second objective, aircraft performance characterization, focused on stall testing to define the boundaries of controlled flight, engine-out maneuvering to understand how to control the aircraft if one or more engines malfunctioned, and parameter identification flights to evaluate how movements of flight control surfaces affected the airplane’s performance. In 52 flights from July 2008 through December 2009, engineers quantified the dynamic response of the aircraft by sending computer commands to the X-48B’s flight control surfaces and measuring how quickly the plane responded to the inputs. The third and most important objective were limiter assaults, in which the remote pilot deliberately exceeded the defined boundaries of controllability – such as angle of attack, sideslip angle and acceleration — to see whether the airplane’s computer could keep it flying steady. Eight flight tests validated the programmed limiters and gave the team confidence that a robust, versatile, and safe control system could be developed for such an aircraft. Tests with the X-48B will continue later this year, after a new flight computer is installed and checked out. The next series of flight tests will focus on additional parameter identification investigations. 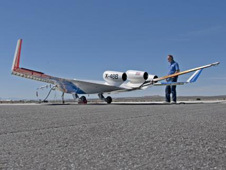 NASA has a second hybrid wing body aircraft, the X-48C, which it has modified for a noise profile even lower than the X-48B’s, and is preparing for test flights to investigate other controllability factors.